A few hundred yards from the office where I work, 22 people were murdered on Monday night by a suicide bomber. A further 64 people were injured, many of them seriously. Among the dead were children and teenagers, and their mums and dads who’d come to collect them from a pop concert at the Manchester Arena. The victims came from across the north of England. It was the worst terrorist attack in the UK for 12 years and the concert had been deliberately chosen to gain international attention and kill as many young people, particularly girls, as possible. Colleagues from my office and their children were among the injured and the dead. The suicide bomber, 22-year-old Salman Abedi ,was born and brought up in Manchester, his family had fled the Gaddafi regime in Libya in the 1990s and somehow he had become ‘radicalised’ into a destructive perversion of Islam that made him think murdering children was worthy of God’s blessing. On Tuesday, on advice from my bosses, I worked from home. The area around our office was a ‘security zone’ in lock down. The city’s second biggest railway station, Victoria, was closed. Meanwhile, the body parts of those killed remained at the scene of the crime. At home it was hard to concentrate on much. The news was about nothing but the bombing, and quite rightly the General Election campaign was suspended. Checking in with my work team it was clear how shaken and upset many of us were. The horror of indiscriminate terror was suddenly a part of our lives. We all knew the Manchester Arena. We knew people who were there the night before. There were friends of friends who were missing. All around the world that day there was reaction to what had taken place. But it was Donald Trump, speaking in Jerusalem at the Israel Museum, who was determined to co-opt Manchester into his new narrative of terror. What was Trump’s speech on Islam missing? American Muslims. President Trump, like his predecessors before him, has discovered the potent language of religious tolerance and interfaith unity when discussing Islam, as he demonstrated in his speech in Saudi Arabia to leaders of some 50 Muslim nations. But unlike previous presidents, he has not linked that rhetoric with recognition of the large, vibrant Muslim community in the United States. As a historian who has studied efforts in the past to build acceptance of religious pluralism in the United States, I am concerned by Trump’s departure from historical precedent. Can a message of tolerance to Islam abroad be persuasive without a corresponding affirmation of American Muslims at home? Greater Manchester police ran a mock anti-terrorist operation a year ago featuring a bomber shouting in Arabic, “Allahu akbar,” or God is great. Eight hundred volunteers took part in the overnight drill at a huge shopping center on the outskirts of the city to make it as realistic as possible and prepare the city’s emergency services for an attack. But the day after the practice drill, authorities apologized to the city’s Muslim community and admitted they had been guilty of stereotyping. After Monday night’s suicide bombing, many Manchester residents praised police, fire and ambulance workers for their rapid response. The 22-year-old suspect in the suicide bombing, for which the Islamic State extremist group claimed responsibility, was described as an English-born son of Libyan immigrants. Muslim leaders were among those who were quick to condemn the attack, which killed 22 people and wounded dozens, and declare that the city would not be divided. Mohammed Shafiq, the chief executive of Ramadhan Foundation in Manchester, said in a statement that the deadly explosion after an Ariana Grande concert was the “darkest day” in the city’s history. “I love Manchester and its people — we are a resolute people and will not be divided by these barbaric animals or cowered by their violence,” he said. LaunchGood, which raises money for both projects and cause work that empowers Muslims in need, and for the Muslim community to return the favor, is helping respond to the Manchester attack. ISIS has claimed responsibility for a suicide bombing that killed at least 22 people, including children, and wounded nearly 50 others at an Ariana Grande concert at Manchester Arena in England on Monday night. It’s the latest attack in a string of tragedies perpetrated by the Islamic extremist group, which has staged more than 140 attacks in 29 countries, killing at least 2,000 people, since it became active in 2014. In less than 24 hours, however, Britain’s local Muslim community had issued its own response, one that among Muslims, in particular, has become an increasingly popular way to express their support of communities affected by a group that’s obviously not representative of the values and religion they hold dear. A campaign entitled “Muslims United for Manchester” appeared on LaunchGood, a crowdfunding site that works like a blend of both Kickstarter and GoFundMe. The service allows anyone to raise money for both projects and cause work that empowers Muslims in need, and for the Muslim community to return the favor, promoting their own fundraising efforts to improve or support some broader social good. Last week, members of the church where I serve in Springfield, Ohio, were graciously invited to attend a service at Masjid Al-Madina, a mosque that I have probably driven past at least a 1,000 times. Each time I previously drove past the mosque, in the recesses of my mind, I thought, “They are in their world, I am in mine, and we have nothing in common.” It never crossed my mind that the mosque would be a place where friendships could form. I had no idea what to expect. Inaccurate stereotypes had led me to believe that Muslims were reserved, distrustful, unfriendly, and completely uninterested in my Christian faith. To my shame, I believed these stereotypes to be true…until last week. Prior to the events leading up to last Friday, I did not know a single Muslim with whom I could have a cup of coffee or tea and share a good story. In fact, I had never had a casual conversation with a person of Muslim faith. Never. All of that changed dramatically for me over the last three days. About 50 people from my church, male and female, young and old, were warmly welcomed to Al Madina Mosque for a Friday afternoon prayer service designed to help educate non-Muslims about their faith. Imam Yunus Lasania, his wife Zarina, and so many others (too many to name) extended a warm welcome. In fact, it was one of the warmest and most gracious welcomes I have ever received. They invited us back for dinner that night. Instead of being reserved, they exuberantly welcomed us with open arms. Instead of being distrustful, they went out of their way to answer any question that we had, even hard ones about things like jihad and Sharia law. The Imam told self-deprecating jokes to put us at ease. They asked honest, deep questions about my Christian faith, and I realized that in many cases my faith was as mysterious to them as there’s was to me. We discovered areas of commonality, and we talked candidly of deep and significant differences. It was perhaps the most natural and easy conversation about Christianity that I have ever had with people who embraced a faith other than my own. Yunus pointed out verses in the Quran that talk about the Muslim duty to protect the Christians and Jews who live in their midst. These verses come from the Ashtiname of Muhammad, a covenant signed by the Prophet Muhammad to protect Christians and Jews until the end of time. When Imam Yunus addressed members of his own congregation, he gave historical examples of times when Christians extended hospitality and protection to Muslims. 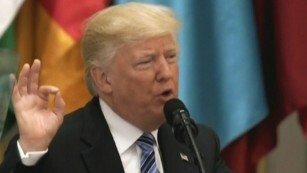 (CNN) President Donald Trump’s speech Sunday will likely be met with skepticism and frustration in the Muslim world, according to experts in the Middle East who said his sudden shift in tone on Islam was unconvincing. Here’s what experts in three Muslim-majority countries in the Middle East thought of the speech. Former Jordanian Justice Minister Ibrahim Aljazy said Trump’s shift in tone towards Muslims was notable. But Aljazy said that Jordanians and others in the Muslim world had hoped Trump would deliver clearer answers on American policy in the region. “I would not call it a constructive tone since that people in the region, particularly Jordanians, are looking for a more clear approach to the Israeli policies and an end to settlements, which may pave the way for a true two-state solution and end of occupation,” he said. “Referencing ‘Islamic’ terrorist organizations only will not be appreciated by the vast majority of people in the region when other forces are carrying out acts of aggression, especially as Arabs and Muslims are the prime victims of these organizations,” he said. Trump also failed to acknowledge the importance of democracy and the rule of law in putting an end to the root causes of terrorism, Aljazy said. No American president in modern times has disparaged Islam as much as Donald Trump. From the attempted visa ban on Muslim-majority countries to his campaign claims that “Islam hates us” to his Islamaphobic advisers, the president’s record of hostility is well documented. So his first overseas trip as president is something of a paradox, with a first stop in Saudi Arabia — a major force in the Sunni Arab world —- that includes meetings with members of the royal family, a summit meeting with other Arab leaders and a major speech on Sunday. Does that mean Mr. Trump has changed his stripes? Given his casual approach to the truth and his malleable belief system, it’s impossible to know his true views on Islam. What we do know is that he needs all the help he can get from Muslim countries to fight the Islamic State. If he uses the speech and the trip to set a new tone with the Muslim world, that would be greatly in America’s interest. The Saudis, who came to loathe President Barack Obama, are falling over themselves to turn the page. Mr. Trump’s decision to visit Saudi Arabia “lays to rest the notion that America is anti-Muslim,” the Saudi foreign minister, Adel al-Jubeir, told reporters early this month, ignoring the fact that the real issue is not whether America is anti-Muslim but whether Mr. Trump is. It was he, after all, who stoked xenophobic fires to win the election.